Sometimes, I can’t get over the complexity of manufacturing. Technology is one thing: cars, electronics, robots, rockets – yeah ok, a lot of material streams have to be worked out there. But even small household products that don’t run on electricity involve a production plan. They probably come with 3 or 4 materials in the packaging along with the thing itself, which could also be a conglomerate of materials. We see a lot of those things at the Mount Lorne Transfer Station(TS) (though not that many rockets). Streams of raw materials, semi-manufactured materials, and final parts flow from all over the world to factories where our little thing gets made and packaged. It’s challenging to see the scale of this because we typically only see what is in stores or a picture of one thing online or what is in our weekly garbage container. But the scale is huge. I could see that Mount Lorne had a commitment to these processes and I could also see that a lot of other neighbours were engaged in sorting and dropping off (and picking up). It was tough a first to convince myself that my little part was going to make any difference whatsoever. It seemed like a lot of work on my part for some recyclables and the odd re-usable thing. But two things conspired to make it easier to see. First, it was a great influence that the TS was just down the road. I could see that Mount Lorne had a commitment to these processes and I could also see that a lot of other neighbours were engaged in sorting and dropping off (and picking up). Secondly, I came to terms with the fact that I bought these things. It’s pretty easy to assume that the garbage man, the government, the recycling centre, the bottle return depot, the re-use stores, and places like the TS are there to handle all this for me. Once I’m done with the thing that I paid for, someone else takes over. But that’s not really it. The thing is here, in my possession. I am ground zero. In order for those other systems to make excellent progress, I have this role to play to get materials to them in the way that is needed. These are fair observations. But then came the excuses. I don’t know where to put everything. Do I have to take it apart? It’s messy. How will I sort it? It takes too much time. Of course, at the beginning it did take time. My system had to get worked out. But once I figured it out, it was no big deal to clean containers or take stuff apart or sort it. It became a part of the household routine. It worked its way into the available space. Then, something interesting started to happen. I became aware of the flow of each material. I saw them separated, stored up and taking their own volume. I could see what the materials were and sometimes, how they were put together. I could see what the materials were and sometimes, how they were put together. I started to see what garbage was. I started to see what garbage was. I started to see items by their materials. Admittedly, this has yet to take hold while shopping. I am still wooed by marketing and my apparent need for things. It is pretty rare for me to make a buying decision based on materials or packaging. But I could see that coming into play, in the same way that Fair Trade ethics or Organic food has made a difference for consumers. I get that there are often strong motives for a lot of materials in products and packaging -like durability, safety, protection, etc. – but by becoming aware of my immediate material flow-back to the TS, I have fodder for future thinking about what I am sourcing from the marketplace and what the marketplace is providing in the way of materials. For now, the habit is formed. I just do it. 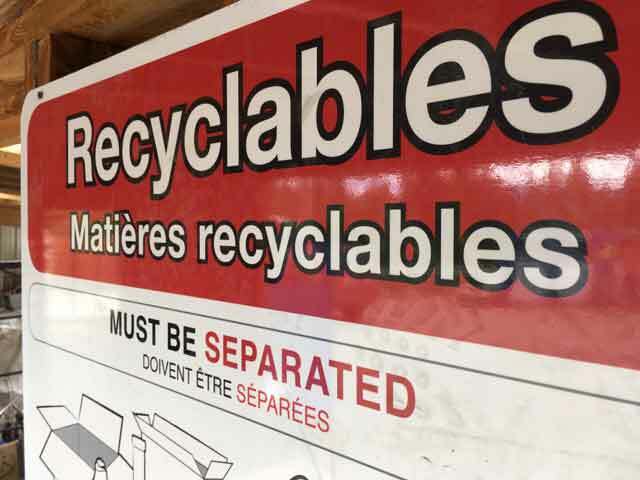 I adjust the separating as I become aware of changes at the TS or ones further down the line (Recycling companies have reportedly come down hard on the purity of material separation. They promise to reject shipments if the materials are not up to their purity standards). This is a big deal. To keep the TS streams pure, I have to do my part, but more than that, all the materials need to be thought of as resources. They might feel like a kind of garbage, but they are actually valuable in a whole new way. I see people doing the separating at the TS instead of at home and that is a preference that works just as well. Any system that keeps the TS bins and containers full of the pure materials that are intended is helpful.